It’s commonly agreed that the Stanley Cup is the hardest trophy to win in professional sports. Between four best-of-seven series, a minefield of dangerous opponents and referees that are always trying to screw you, the NHL playoffs are not for the faint of heart. The struggle, of course, is what makes the triumph so satisfying, and players often say that tasting success once only heightens your hunger for more. On the other hand, there is nothing more devastating than immersing yourself in the journey and falling a few wins short. The Stanley Cup, at once, conjures tears of joy and tears of heartache; it is likely the only thing on this planet that makes hockey players cry. We’re only considering players who have been in the League for at least five years – so don’t scream at the omission of Connor McDavid. We will be weighing past and current performance equally. This is about determining which players are the most deserving of a championship based on their entire body of work. That being said, we’re not concerned with how close players have come to a title in the past. It’s not John Tavares’ fault he’s been saddled with lesser teammates. We’re trying to assemble a “team,” so a player’s position matters. If the three best forwards are all centers, we’re only taking one. Finally if I left out your favorite player, it’s probably because he’s not very good and I don’t like him. Cool? Cool. The guys below are a mix of MVP’s and scoring leaders. Norris Trophy-winners and Vezina Trophy-winners. Perennial All-Stars and franchise cornerstones. And the great irony is each one of them would likely trade all the individual accolades for a single Stanley Cup ring. (At least hockey culture says they should.) Without further preamble, here it is: the Eastern Conference All-Star team no one wants to be on. The Reason: When thinking of current stars who haven’t won the Cup, Lundqvist is almost always the first who comes to mind. Most of that is due to his impeccable track record; since entering the NHL in the 2005-06 season, Lundqvist leads the league in wins. But it’s also a product of his visibility; the suave Swede is a fixture in the NHL spotlight, and has always seemed to shine on the sport’s biggest stage. In a must-win game, there’s no better option in goal. The Anguish: After struggling to get past the second round of the playoffs through the first six seasons of his career, Lundqvist has come tantalizingly close to hoisting the Cup in the years since. The Rangers have advanced to the conference finals in three of the past four seasons – including a trip to the Cup finals in 2014 – with Lundqvist leading the way. All of a sudden, the 2006 gold medalist has more playoff wins than any active goalie. To say he’s tortured by his lack of a championship is probably an understatement. The Outlook: It’s commonly acknowledged that the Rangers’ Stanley Cup window is closing. They rely heavily on an aging core, and a few of their key players are showing appreciable signs of decline. The Blueshirts are still a contender in the Eastern Conference, but it will take a heroic effort from Lundqvist to push them to the top. The Outlook: Not good. Eugene Melnyk, the Sens’ notoriously tightfisted owner, seems more concerned with cost-efficiency than Stanley Cup championships. As long as Karlsson remains in Ottawa – he’s signed through the 2018-19 season – it’s hard to imagine him shaking this monkey off his back. *A quick word on this: there were a number of defenseman in the 90’s putting up gaudy offensive numbers. Leetch’s 85 points in the 1995-96 season don’t even crack the top-10 of that decade. But within their respective eras, the numbers for Karlsson, Coffey and Orr stand alone. The Reason: Here’s where that body-of-work condition comes into play. Phaneuf is far from the end-to-end force he was in Calgary, and pales in comparison to most guys on this list. But his resume speaks for itself. After playing in consecutive All-Star Games and finishing second in Norris-Trophy voting at the conclusion of the 2007-08 season, Phaneuf was legitimately in the conversation for best defenseman in the League. (Somewhere in Sweden, Nicklas Lidstrom chuckles and rolls his eyes.) He’s lost a step or two in the years since, but that doesn’t obscure what a fine player he was for the Flames. 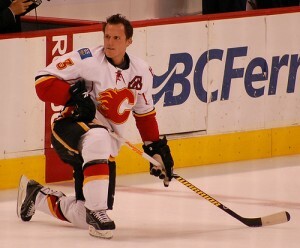 With the Flames, Phaneuf was considered one of the top defensemen in the game. (Charles Sztova/Flickr). The Anguish: People tend to forget that the Flames were a playoff-regular in the years following the 2004-05 lockout. Behind Phaneuf and Jarome Iginla (the ultimate Cup-less All-Star), Calgary qualified for the postseason every year until trading Phaneuf to Toronto in the 2009-10 season. And Phaneuf gets extra anguish points for the Leaf’s epic Game 7 loss to the Bruins in 2013. 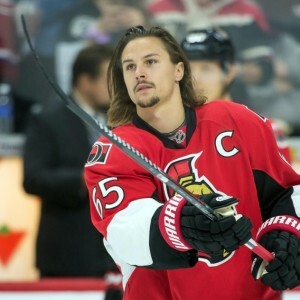 The Outlook: Remember what we said about Karlsson? The same is true for Phaneuf, only he’s five years older. Yeesh. Still, as far as rings go, the one he got from Elisha Cuthbert feels like a pretty good consolation prize. The Reason: Words rarely do Ovechkin’s accomplishments justice, so we’ll let the following stats speak for themselves. The three-time MVP has led the league in goals each of the past three seasons and is on his way to a four-peat; no player has won four consecutive Rocket Richard Trophies since Wayne Gretzky from 1981-82 – 1984-85. With 518 goals since his 2005-06 rookie season, Ovechkin leads Jarome Iginla, the second leading scorer in this span, by 160 goals; in fact, Ovechkin has more goals than anyone since the start of the 2000-01 season despite entering the league five years after most of his immediate challengers. Finally, his 65 goals in 2007-08 are the most anyone has scored since Mario Lemieux dumped in 69 20 years ago; adjust Ovechkin’s total for his era and its doubly impressive. I guess what we’re trying to say is the guy’s pretty good at putting the puck in the net. That come through? The Anguish: Fair or not (it’s not), Ovechkin has earned a reputation over the years as a guy who comes up small in big moments. 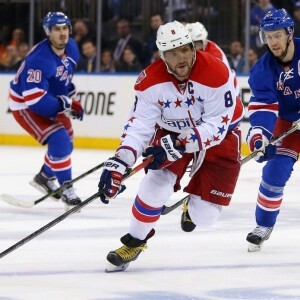 Regular season dominance has led to nothing but playoff disappointment for the Caps, and Ovechkin, by virtue of being the team’s best player, has taken much of the blame. (With 70 points in 72 career playoff games, the numbers suggest he’s been let down by the players around him.) He’s been labeled a choke artist, a disappearing act, and a player who “doesn’t have what it takes” – for some reason, it’s extremely important that he’s European in regard to all this. But if there’s one player who burns for a championship as fervently as Lundqvist, it’s Ovechkin. The Outlook: Of everyone in this cask of Cup-less standouts, Ovechkin seems to have the best shot at breaking out. At 30 years old he still has plenty of productive years ahead of him, and more importantly, he’s on a legitimate Cup-contending team in a conference with very few others. The Caps might not win it all this season – it would be sooooo them to flame out in the first round, after all – but it feels inevitable down the line. The Reason: Before Patrick Kane surged to the top of the scoring charts this season, there was a case to be made that Kessel was the best pure goal scorer among American-born players. (Although Max Pacioretty and Zach Parise would want a say in that.) Since breaking through with a 36-goal season with the Bruins in 2008-09, Kessel ranks 4th in the NHL with 238 goals – guess who’s first! – having done most of that work on some consistently awful Maple Leaf teams. He was also the last player selected in the 2011 All-Star Game fantasy draft, a public shaming for which was he awarded a free car. So there’s that. The Anguish: When it comes to playoff torment, Kessel is actually an underrated victim. There was the Game 7 meltdown against Boston in 2013, a game in which Kessel helped stake the Leafs to a 4-1 lead with two third period points. And he is further scourged by the fact that the Bruins won a Stanley Cup in 2011, just two seasons after shipping him off to Toronto. “So close, yet so far,” has quietly become a theme in his career. The Outlook: He’s not quite the lock that Ovechkin is, but Kessel’s got a great chance to snap his Cup curse in Pittsburgh. Perhaps no team in the league has as much as high-end talent up front, and enough veterans remain from the team’s Cup run in 2009 that the Pens have that know-how vibe. The Reason: This one was a real toss-up between Stamkos and Tavares. Ultimately, Stamkos’ two Rocket Richard trophies (2009-10, 2011-12) were enough to nudge him in front. Both players are generational talents, franchise pillars, and more or less human highlight reels. But where Stamkos separates himself from Tavares is in the physical aspect of the game. The former first-round pick is more of a bull than people realize – it’s funny, something about exploding water bottles with heat-seeking one-timers has always drawn more attention. The Anguish: Stamkos has flirted with a Stanley Cup championship twice in his seven year career: in 2010-11, when the Lightning lost to the Bruins in Game 7 of the conference finals, and 2014-15, when they fell just two wins short of immortality at the hands of the ‘Hawks. He’s not quite in Lundqvist/Ovechkin territory yet, but that goose egg in the championship column has to be gnawing at him. The Outlook: It’s only a matter of time. Stamkos is surrounded by young, cost-controlled talent in Tampa Bay, and the Lightning seem on the verge of a long run of success. Oh, what’s that? Stamkos is a free agent at the end of the season? And he hasn’t signed an extension? And negotiations have stalled? And he’s been looking at property in Toronto? And he just bought a customized Maple Leafs jersey with his name and number on the back from NHL.com? Huh.